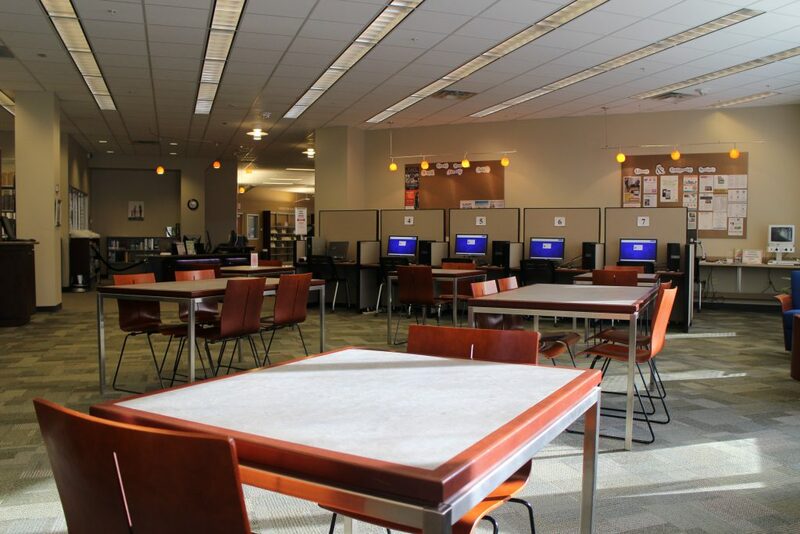 Located on the first floor of the Nancy Guinn Memorial Library, the Adult Services Department offers a vast collection of resources ranging from traditional print to e-books and online databases. Adult Services also provides spaces to relax with a book or magazine, conduct research, or engage in individual and group study. Patrons who have a valid PINES card and are 18 years and older may use the Adult Services reference and law library computers to access our many Galileo databases, such as Mango Languages, Reference USA, Learning Express, Ancestry Library edition, and WestLaw Next. Patrons may also access the majority of these databases using their own device and connecting to our free WiFi. Guest passes are available to out-of-state visitors. The Adult Services Department also has a copying station available for use. The cost of copying documents is $0.15 per page (black and white only). We don’t have a color printer in the library. The Adult Services Department offers a variety of programs for adults 18 years and older, as well as collaborative family programs for all ages. All programs, events, and classes are free and open to the public! The Law Library and Genealogy (Georgia) Room houses our law resources and genealogy collection. Located in this space are maps, a microfilm reader, over two thousand rolls of microfilm, historical documents and census records, law books, and computers with access to WestLaw Next. Patrons may search our collection using the PINES catalog or ask for assistance at the Adult Services desk. For our circulation policy, instructions on how to place a book on hold, or registering for a PINES library card, please refer to the circulation page. Patrons may also obtain books through Interlibrary Loan service. The fiction section is located on the left of the main entrance and houses thousands of adult fiction titles. New fiction books, which include best sellers, large print, graphic novels, and paperbacks are ordered regularly. The reference section is located near the circulation desk between adult fiction and the adult services desk. Reference materials are provided to assist patrons with their informational and research needs and are for in-library use only (not available for check-out). The non-fiction section is located to the left of the circulation desk and houses a large variety of non-fiction titles. Genres include technology, philosophy and psychology, religion, social sciences, languages, natural sciences, applied sciences, arts and recreation, literature, history, geography and biographies. We offer an extensive collection of e-books available through Axis 360, and by simply downloading the app and using your valid PINES card, you’ll have instant access to hundreds of titles. Audio books are an excellent alternative for those who frequently travel or are visually impaired. We offer a wide selection of both fiction and non-fiction. Adult Services provides patrons with access to popular magazines, available in print and online format through Flipster. Our movie collection located near the main entrance and adjacent to our music collection, offer hundreds of titles that feature works in a variety of genres, including documentaries, Westerns, foreign and silent films, and tv series. Our music collection is located across from the circulation desk boasts hundreds of CDs in 18 different genres, including country, alternative, sacred, R&B, comedy, poetry, NPR in a mix of new releases and popular classics. The music area also features a selection of music-related books, live performance DVDs and biopics.